The Spring/Summer fashion bible you need now | HELLO! February 15, 2016 - 14:18 GMT hellomagazine.com Out now! Want to see hundreds of the hottest new season looks in one glossy issue? 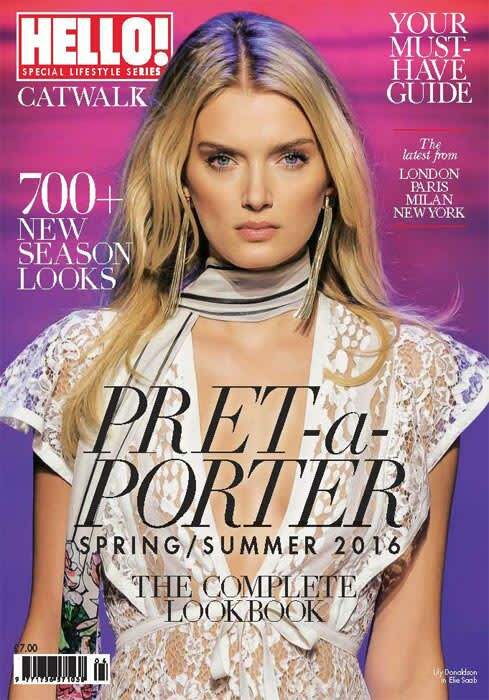 HELLO!’s Spring/Summer Prêt-à-Porter catwalk special brings you the very best from Paris, Milan and New York, plus over 70 pages of amazing British labels. Follow the catwalk queens in action on the world’s most prestigious runways, from our British cover girl Lily Donaldson to sister act Gigi and Bella Hadid, Instagram princess Kendall Jenner and model of the year, and another Great Brit, Jourdan Dunn. Discover what Hollywood stars will be wearing this season on the red carpet and get to know the royals’ go-to designers. Plus the latest It-bags and accessories, sizzling new swimwear and how to work the trends. All in one fabulous lookbook, on sale 16th February! Prêt-à-Porter Spring/Summer 2016 is on sale 16th February. Available in selected stores nationwide and for download on Apple and Android devices. To order a copy & have it delivered to your door click here:subscription.co.uk/hello/pret .